Lately I've been thinking a fair bit about seasonal reading lists... 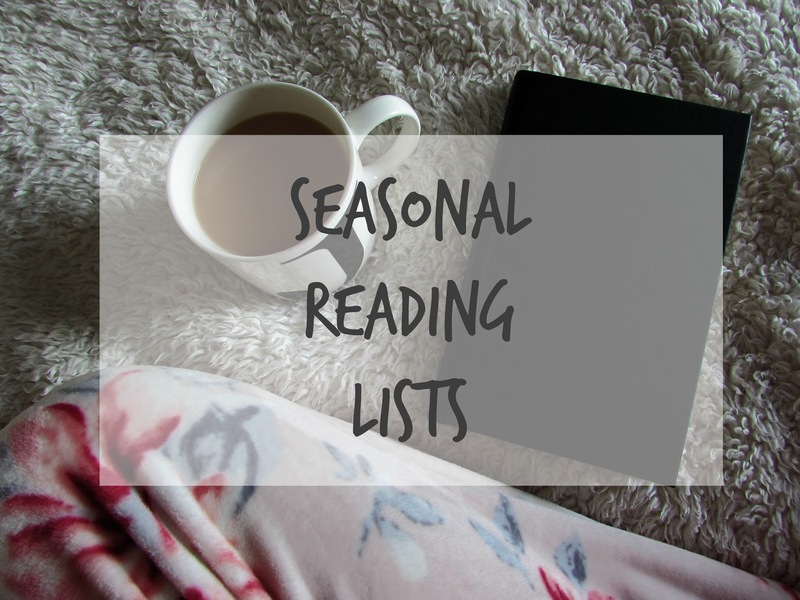 I've always had bumpy relations with TBR lists, often times with me not completing them, however with the way I've been reading of late I think I could really benefit from introducing seasonal reading lists into my life. Seasonal reading lists... Not a TBR. The way I approach things often has an impact on the outcome of any given task, as I'm sure it does for many, and that's why I'll be switching up my mind set from TBR (to be read) list to a reading list. I get that they are basically the same thing - a compiled list of books that you hope to read over a certain period of time - however I associate TBR's with negative thoughts and feelings of failure. By putting together a seasonal reading list, I'll have a stack of carefully selected books that I'm excited to read within a given season. There will be no pressure, no negativity involved, no feeling of overwhelm because these books need reading... The aim is to return to my favourite pastime of reading, taking comfort in books and enjoying the written word. A large reason as to why I'm going to start taking on seasonal reading lists is because I want to enjoy reading once more, although I'm sure there will be other benefits too. Allocating a set amount of money at the start of each season means I'll be able to keep the amount of money I spend on books to a minimum. As of right now I haven't set that figure, but I'm thinking somewhere between £30-£50 for a season. I wouldn't need to buy all of my books at the start of the season, but so long as it stays within budget over the entire three months - I would like to start each season with a base list of books though. My reading list will include a variety of genres, as well as different target audiences. I read quite eclectically in general, but when I'm really feeling a particular genre, let's say crime, then I'll often burn myself out reading all the crime books, and this is something I want to avoid. I want to intentionally read more widely, and I think that'll be easier to do with a reading list, as I'll be carefully selecting the books that will be laid out for me in the coming months. This is has basically been the year of reading slumps for me - and I want to work on this. I think having a reading list will help for a couple of reasons, the first being briefly touched upon in the above section of variety. The second reason I think a reading list will help is the fact that I'll be giving myself reading perimeters almost, with a set list of books, and so I think that will help me to be less flitty and finicky with my book choices. For the most part, I've always been someone who read freely, picking up books that suited my mood and going with the flow of feeling, however this year has been a funny old one for me in terms of books and I haven't been enjoying the experience - not of reading, but of the slumps and such. I want to read, I love to read, and by making it a little more low maintenance, I think I can find that joy once more. Along with making reading a little more low maintenance - it doesn't matter if I don't complete a book within a set amount of days or a week etc - this approach will be taken to my blog also. I will still be sharing content here as I love book blogging and the community I've built here, but there will no longer be a set consistency to my posting. When there's a book I want to rave about, I'll share, or when I feel inspired to sit and write, I'll share. I think putting a pressure on both reading and blogging, two of my favourite hobbies, has sucked a little of the fun out of them, and I'm keen to get that back. I've been working on my mindset and improving the way I live my life for a while now, with a more mindful approach, enjoying the little things and taking note from the slow living movement, and this change goes hand in hand with that really. Good luck! I used to do monthly TBR lists, but I got bored with them. I don’t like putting pressure on myself to read something. Now I just read whatever I feel like reading, or I pick something random. This sounds like a great way to go about rediscovering the joy of reading. Best of luck, Jade! I think it's a great idea! TBR often does have a connotation of a towering pile of books that is intimidating, so I totally get it. I'm a mood reader so I definitely have to be into the book I'm reading, if I feel like I HAVE to read it that takes the fun out of it for me. Sounds like you've got a handle on what you need! It's so easy to get overwhelmed with all the books that are out there and all the ones you want to read. I like the idea of seasonal reading. Good luck! This sounds like a wonderful approach to take. I know for myself that if I held myself to a set blogging schedule, I'd have quit long ago! Ooo... I'm off to read this post of yours now. I hope you had a lovely vacation!